I spent part of my day planning my next unit of study, which I am very excited about. (More about that later!) This unit includes our poetry study of George Ella Lyons’ “Where I’m From”. I’ve been doing our version of these poems since I began teaching and it’s always an amazing experience. I think Paul Hankins first introduced me to George Ella Lyons and I am so grateful that he did. So in the next few weeks we will be writing our poems in class, but I’ve included my poem below. (green, soft and smelling like summer). (an orange and pink sunset growing toward the sun no matter the season). From eating your crusts and haunted old roads. I’m from Psalm 23, bagpipes playing hymns, and rosary beads. Grandmother macaroni and breakfast for dinner. from Nanny, following Papa around the country during his naval years, raising a son with a husband fighting in a great war. I am from the photo albums and boxes of pictures in the upstairs closet, telling the stories of a loud, large, and loving family. I can’t stop watching this commercial, which I first saw during the Golden Globes. What a soul-lifting, heart-building, mind-blowing visual from Apple. Absolutely beautiful and I hope people take the message to hear. Poetry and Science- Perfect Together? Last Friday a colleague and I took some time for professional development at a high school in northern NJ that has a program similar to ours. I was very excited to meet Erin Colfax, co-author of the upcoming Writing Poetry through the Eyes of Science: A Teacher’s Guide to Scientific Literacy and Poetic Response. (We have already ordered a copy and I can’t wait to take a look at it!). Erin was an absolute inspiration. The woman literally does everything. She designs research projects all over the world and travels to collect the necessary data so that she can bring it back to her students. On top of this, she is one of the leaders of the Science Academy program at Morristown HS and co-teaches in English and History. She and her co-teachers work together to integrate science and research into the content areas and the results are amazing. Erin told us how she studied with an embalmer in town during the Civil War unit and then they set up a mock embalming in the classroom, where the embalmer used Civil War era tools. How awesome is that?! And that is only one example of the amazing things she is doing. Personally, I was thrilled to talk to Erin about English. I am a science geek and for a long time considered a career in science before I decided to be an English teacher. As my bio colleague (and my former bio teacher!) always reminds me, I am still pretty involved in science thanks to the Monarch Teacher Network. But Erin helped write Writing Poetry through the Eyes of Science: A Teacher’s Guide to Scientific Literacy and Poetic Response and I was dying to pick her brain before I got my hands on the book. Let me tell you- Erin and Nancy are both amazing! The way Erin described her Science and Poetry summer camp, it was like my dream come true. And the way they integrate science and poetry is inspirational. Erin believes that the act of writing poetry, designing similes, metaphors, and other figurative language, helps students really learn tough science concepts. You know what? I agree! I am looking forward to talking more with Erin in the future and sharing ideas with her. I also highly recommend Writing Poetry through the Eyes of Science: A Teacher’s Guide to Scientific Literacy and Poetic Response. While it is only available for preorder now, it should ship at the end of this month. (And it will only cost about $30, NOT the crazy price listed on the Amazon preorder page!). I was lucky enough to see a lot of her materials last week and I know it will be well worth it. Helen Frost is one of my favorite authors. While she may not be the most well-known MG/YA author on the market right now, I wish she was! I am constantly recommending her books to my readers. When I was offered an ARC of her newest title, I jumped on the chance. Hidden does not disappoint. If you are a middle school of high school teacher, I highly recommend picking up a copy. When Wren Abbott and Darra Monson are eight years old, Darra’s father steals a minivan. He doesn’t know that Wren is hiding in the back. The hours and days that follow change the lives of both girls. Darra is left with a question that only Wren can answer. Wren has questions, too. Years later, in a chance encounter at camp, the girls face each other for the first time. They can finally learn the truth—that is, if they’re willing to reveal to each other the stories that they’ve hidden for so long. I have a strange attraction to crime stories. I am the person who can’t turn off CNN when they are talking about a missing person. I read newspaper articles and magazine interviews. Hidden was exactly what I was looking for. The story will keep you on the edge of your seat. The chapters alternate between Wren and Darra and you sympathize with both. The suspense alone is reason enough to pick up the book. However, Helen Frost’s real gift is in her poetry. Nothing is ever as it seems, which is what I love. The real magic in every Helen Frost book comes when you start digging deeper, really paying attention to the poetry. In Hidden, Helen Frost has invented a new form of poetry to help give insight into Darra’s story. Darra’s poems are told through especially long lines. But upon reaching the end of the book, you learn that taking the last word of the longest lines allows you to read Darra’s thoughts and memories, seeing the kidnapping from her point-of-view. Due to this, I found myself re-reading the book immediately upon finishing it the first time. The second time through, I simply lost myself in the poetry, paying attention to the word choice, the rhymes, and this wonderful new form. 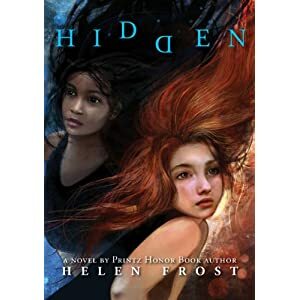 Hidden is perfect for reluctant MG/YA readers. Highly, highly recommended! 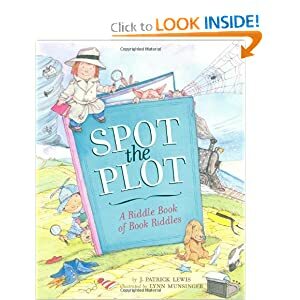 Spot the Plot: A Riddle Book of Book Riddles by J. Patrick Lewis is a great little picture book that every English teacher should have in their arsenal. Full of riddles that challenge the reader to “Name That Book”, it’s a great title for all ages. The books named in the riddles include Charlotte’s Web, Goodnight Moon, Madeline, and much more. I used my copy of Spot the Plot: A Riddle Book of Book Riddles at the end of this past school year. It was one of the last days of the school year. You know the days- nothing on the schedule but locker cleanout, the kids checked out mentally weeks ago, and no one wants to be there but we have to put in a half day. That morning, I pulled out my copy of the book. I decided to make a game of the riddles, knowing how competitive my students were. I copied the poems and divided the class into groups, giving each group a few of the riddles. I explained that the riddles all described famous children’s books, set the timer, and had them get to work. The group that finished first, with the most correct answers, won. The students assumed it would be easy and were shocked to find that Lewis made some of the riddles into real brain-teasers! Like I said, this is a book every English teacher should have a copy of. It’s perfect for those moments when you need something for the students to focus on and you want that something to be fun and meaningful. Highly recommended! Just a few links to some monarch butterfly news. The migration is reaching farther north each week, and I am hoping to see my first monarch sometime soon! The latest Journey North update has maps of the monarch sightings and milkweed growth over the past week. You can sign up to get the weekly updates via email. The New Jersey School-Age Care Coalition has just posted a guide to creating a butterfly garden in NJ school yards, as part of it’s Afterschool Care programs. The brochure is detailed and includes some fantastic ideas. And if you are interested in getting involved with the Monarch Teacher Network (like me! ), there are workshops being offered all over the country. Check out the program’s website and the registration form here. Also, the Voices program is expanding! There is a workshop being offered in June in Texas. I so wish I could go. For more information, check out the website. You can also see my students’ Voices project on the blog a few years ago, along with the book we made. ….and I have cried no less than 3 times since my students started writing their poems. Three students in particular are gifted poets and their poems honestly made me cry (which the rest of the class found amazing). Does anyone have any ideas for publication? I don’t have a lot of resources for places that are interested in student poetry. So far, we have only immersed ourselves in poetry and opened the heart door (thanks, Georgia Heard!). If the poems they are sharing so far are any indication, this might be my best year yet with poetry. They are very open to sharing and I have am getting glimpses into lives that I didn’t know anything about. Poetry is always one of my favorite units of the year because it truly opens a window into the souls of my students. I love opening their eyes to poetry; after years of being required to write acrostics, cinquains, sonnets, and other highly regimented forms of poetry it’s awesome to allow them the freedom to write non-rhyming poems! Even better, they can choose their topics and write about anything they want. My only rule is that every student must dig deep. In other words, no poems like “I like summer. It is not a bummer. We go in the pool. It is cool.” My corny example always brings a few laughs but it seems to sink in. So far, so good. I have learned about parents with breast cancer, the death of grandparents, losing pets, losing friends, growing apart, growing up, and more coming-of-age moments in their tweenage lives. Are your students surprising you this month with their poetry?